GUEST BLOG—BIBLE: 1 Samuel 17--Now the Philistines gathered their forces for war and assembled at Sokoh in Judah. They pitched camp at Ephes Dammim, between Sokoh and Azekah. Saul and the Israelites assembled and camped in the Valley of Elah and drew up their battle line to meet the Philistines (approx. 1200 BC). The Philistines occupied one hill and the Israelites another, with the valley between them. A champion named Goliath, who was from Gath, came out of the Philistine camp. His height was more than 9 feet. He had a bronze helmet on his head and wore a coat of scale armor of bronze weighing more than 125 pounds on his legs he wore bronze greaves, and a bronze javelin was slung on his back. His spear shaft was like a weaver’s rod, and its iron point weighed 15 pounds. His shield bearer went ahead of him. Now David was the son of an Ephrathite named Jesse, who was from Bethlehem in Judah. Jesse had eight sons, and in Saul’s time he was very old. Jesse’s three oldest sons had followed Saul to the war: The firstborn was Eliab; the second, Abinadab; and the third, Shammah. David was the youngest. The three oldest followed Saul, but David went back and forth from Saul to tend his father’s sheep at Bethlehem. For 40 days the Philistine came forward every morning and evening and took his stand. Early in the morning David left the flock in the care of a shepherd, loaded up and set out, as Jesse had directed. He reached the camp as the army was going out to its battle positions, shouting the war cry. Israel and the Philistines were drawing up their lines facing each other. David left his things with the keeper of supplies, ran to the battle lines and asked his brothers how they were. 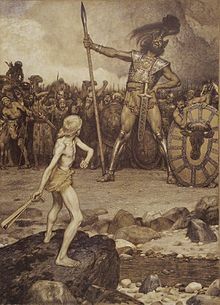 As he was talking with them, Goliath, the Philistine champion from Gath, stepped out from his lines and shouted his usual defiance, and David heard it. Whenever the Israelites saw the man, they all fled from him in great fear. But David said to Saul, “Your servant has been keeping his father’s sheep. When a lion or a bear came and carried off a sheep from the flock, I went after it, struck it and rescued the sheep from its mouth. When it turned on me, I seized it by its hair, struck it and killed it. Your servant has killed both the lion and the bear; this Philistine will be like one of them, because he has defied the armies of the living God. When the Philistines saw that their hero was dead, they turned and ran. Then the men of Israel and Judah surged forward with a shout and pursued the Philistines to the entrance of Gath and to the gates of Ekron. Their dead were strewn along the Shaaraim road to Gath and Ekron. When the Israelites returned from chasing the Philistines, they plundered their camp. 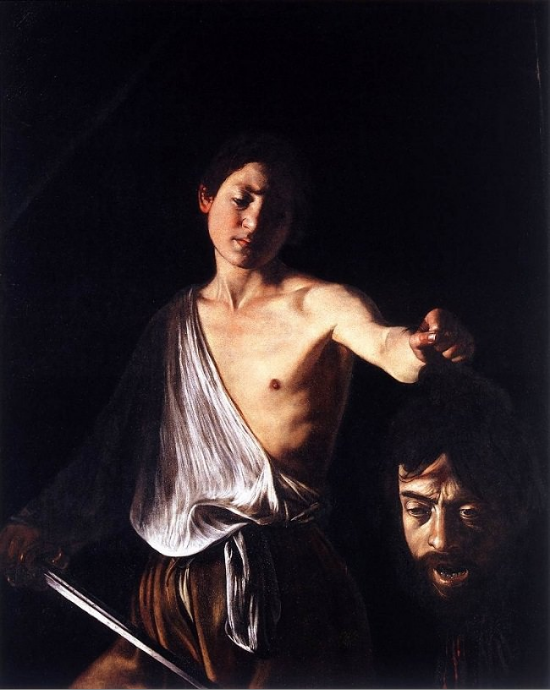 David said, “I am the son of your servant Jesse of Bethlehem." The Philistines were an aggressive, warmongering people who occupied territory southwest of Israel between the Mediterranean Sea and the Jordan River. The name “Philistine” comes from the Hebrew word Philistia, and the Greek rendering of the name, palaistinei, gives us the modern name “Palestine.” The Philistines are first recorded in Scripture in the Table of Nations, a list of the patriarchal founders of seventy nations descended from Noah (Genesis 10:14). It is thought that the Philistines originated in Caphtor, the Hebrew name for the island of Crete and the whole Aegean region (Amos 9:7; Jeremiah 47:4). For unknown reasons, they migrated from that region to the Mediterranean coast near Gaza. Because of their maritime history, the Philistines are often associated with the “Sea Peoples.” The Bible records that the Philistines had contact with both Abraham and Isaac as early as 2000 B.C. (Genesis 21:32, 34; 26:1, 8). –GotQuestions.org.